The Phantoms continue their quest for the 2018 Calder Cup Championship this weekend as they begin their best-of-seven Eastern Conference Finals series against the Toronto Marlies. 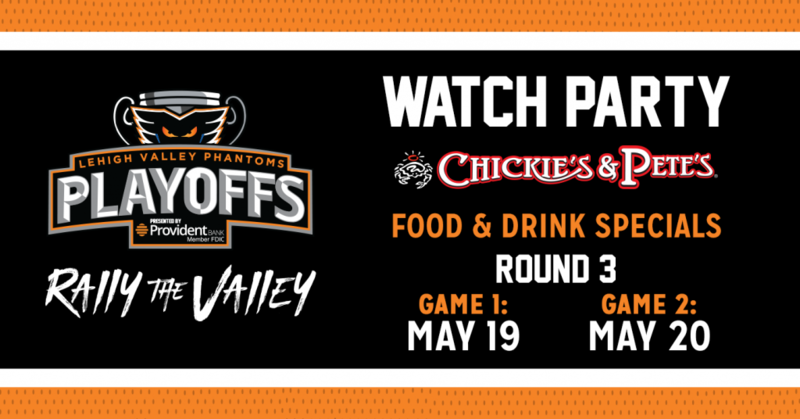 Join us at Chickie’s & Pete’s at PPL Center this Saturday, May 19 and Sunday, May 20 for the team’s Official Watch Parties for Games 1 and 2. Doors open at 3:30 p.m. with food and drink specials set to begin at 4:00 p.m. as the puck drops live from Ricoh Coliseum in Toronto. Let’s Rally The Valley! 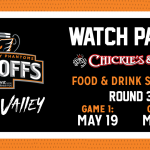 The post Eastern Conference Finals Watch Parties @ Chickies & Pete’s – Saturday, May 19 & Sunday, May 20 appeared first on Lehigh Valley Phantoms.